If you’ve been having bad luck finding a job, chances are there’s a good reason why. Here, Peter K. Studner shares 17 tips that will help you conduct a more successful job search campaign. If you’ve spent more than a few months searching—unsuccessfully—for a job, you’ve probably latched on to a reason or two why you can’t seem to land an offer. It’s the economy. They know I’m an older candidate—this is clearly ageism. I bet they had an internal candidate picked out from the beginning. Everyone wants candidates with experience—but no one is willing to provide that experience to rookies! Whatever your reason is, maybe you’re right. Or, says Peter K. Studner, maybe you’re in denial. In some instances, Studner says, your path forward is clear. For example, if you’re a candidate of a certain age, take some courses to update your skill set. Search for industries and companies known for hiring older candidates. (AARP is a good resource.) Or if you feel that internal candidates always have an edge, step up your networking efforts and schedule informational interviews with decision makers at companies in which you’re interested. Your résumé and cover letter need work. If you want to succeed in your job search, making a few tweaks to your old résumé won’t cut it. Spend the time you need to make sure your résumé is clean and readable, and that it accurately reflects your current accomplishments, skills, and employment history. Ask yourself: Is my résumé up to date? Is it full of clichés? Is it just a job description? (Just because you had responsibilities is no guarantee that you actually did them!) Has it been edited to reflect this job’s requirements? Has it been proofread? Does it make sense when read aloud? The same criteria apply to your cover letter. Avoid generic phrases, address the company’s needs, and always try to write to a person (not “To Whom It May Concern”). You aren’t spending your job search time wisely. Many job seekers answer only published advertisements. But at the end of the day, people get jobs from people. Make it your goal to meet 15 to 20 people each week for advice, research, or direct interviews. (See Super Job Search IV for techniques on how to maximize each type of interview.) Reserve your evenings or before 7:30 a.m. for the Internet. The more people you meet, the closer you’re getting to real job opportunities. Networking is one of the best ways to speed up your search! You aren’t spending enough time on your job search. Especially if you aren’t currently employed, searching for a job is a full-time activity. Anything less is cheating yourself. If you put in only an hour or two every day, don’t be surprised when more dedicated candidates get the jobs you wanted! You did not take the time to memorize your résumé so you can respond brilliantly to interview questions. Even if a pro wrote your résumé, you must come off as the author. In an interview, you are the résumé, and if you cannot discuss all of its content convincingly and intelligently, your interviewer may be thinking, I sure would like to meet the person who wrote this, but not the person in front of me! Practice with a recorder makes perfect. What are your reasons for leaving each job? If you have changed jobs frequently, there could be doubts that you will last long with this potential employer. You have to be convincing regarding your intentions. Tell me about yourself. Don’t bring up superfluous items. In advance, prepare and rehearse a 90-120 second presentation presenting the essence of what makes you a unique, experienced, and engaging candidate. Mention your background, your skills and specialties, and a few examples of your major accomplishments and responsibilities. What do you find difficult about this job? Careful. While you want to impress the employer, don’t overstate what you are not sure of. Better to admit you need to learn something, followed with a learning experience from your past. Give me an example of when your work was criticized by your last employer. Try to make this an experience that made you a better employee. What do you know about our company? You can learn a lot about people and companies before your meeting. For people, check LinkedIn. For companies, explore their official site and then check for news articles about them on popular business sites (Yahoo, MSN, CNN, etc.). Tell me about your skills that apply to this job. Give examples of your accomplishments for each. If you have a job description for the position for which you’re interviewing, pair the requirements with one or more of your accomplishments. How do you feel about 50 percent travel? This may be tough. Discuss this with your family before your interview. Do you speak any foreign languages? If you answer in the affirmative, be prepared to be tested. What are your computer skills? Again, be honest. You may be tested! What would your last supervisor say about you? Nice things, you hope. If you are still employed, smooth out any differences with your employer before leaving. Remember, you need their reference. How is your health? This is not the time to bring up old operations or health challenges. If your health is good, say so. Your interview replies are too long and wordy. Stay focused on the question. Pay attention to the interviewer’s body language and facial expressions for evidence that he or she is becoming uninterested. Do not talk yourself out of a job. You’re too negative. Do not be disparaging about a previous employer or person. If you do not have anything nice to say, better to keep quiet. You share confidential information. Discussing confidential information from a previous employer may be useful at the moment, but it sends a negative message about your discretion. You’re showing that you cannot be trusted. You are not dressed properly. Either over- or under-dressing is a negative. Don’t wear cologne. And make sure your tattoos are covered, if possible. Your behavior is unprofessional. No chewing gum or smoking. Make sure your posture is confident and alert. Watch your language and leave street talk out of your conversations. You have not properly prepared your references. Tell your references about the jobs to which you’re applying and the interviews to which you have been invited. If possible, coach each reference on how best to support your campaign. Mention skills and accomplishments you’d like them to highlight. They can sabotage a candidacy with an innocent remark. You arrive late for the interview without calling ahead. If you run into an unavoidable delay (e.g., both lanes of traffic are shut down due to an accident), call and let the company know. You exaggerate your accomplishments. Stick to the facts rather than ballpark your achievements. You were rude to people in the company before or after your interview. News of bad manners travels fast. You argued with an interviewer. This is not a good way to sell your skills. You seem uninformed about the company. When asked for your questions at the end of the interview, respond with queries that are pertinent to the company’s growth, new products, expansion, and marketing. 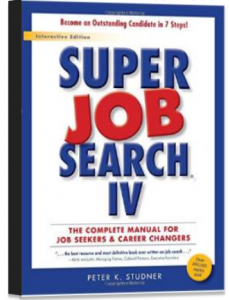 For more information on job search techniques, strategies, résumés, cover letters, and resources, see Super Job Search IV.